I recently came across a graphic that stopped me in my tracks the first time I saw it. 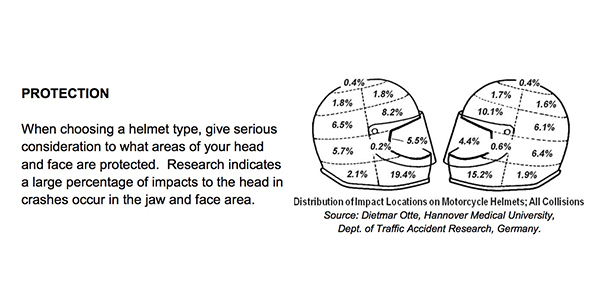 I was taking my motorcycle Basic Rider Skills course to get my motorcycle license, and in the manual there was a graphic from the Department of Traffic Accident Research in Germany, which identified the areas of the head that are most commonly impacted in the event of a motorcycle crash. The graphic showed that nearly 35 percent of impacts to the head occur in the jaw and face area. With this scientific information readily available in all motorcycle education manuals and courses, it emphasizes the importance of full-face helmet coverage. Protection and proper fit should be the most important factor for customers when it comes to choosing a helmet, however full-face helmets inherently have several other benefits that you can point out to them. Full-face helmets bring the padding down further across the cheeks, and to ensure maximum comfort, many offer different sizes of cheek pads that can be changed out to find the best fit for the contour of the wearer’s face. Aerodynamics have a considerable impact on comfort, most noticeably in the areas of reduced wind buffeting and noise. In addition to reducing wind noise, several new full-face helmets on the market are offering added noise-reduction technology. Although this technology is improving in helmets, it is not a replacement for complete hearing protection. Premium helmets are lightweight and also offer excellent ventilation to combat the hottest of summer days. Visors and multiple sun shield options protect against wind-burn, sun glare, sunburn and harmful UV rays, reducing fatigue on a long ride. Road debris or a swarm of insects are always imminent hazards that are eliminated with a full-face helmet. Full-face helmets offer protection from wind and anything else that nature has to throw at riders. Some customers may be concerned about decreased blind spot visibility and not being able to see who is approaching their blind spot as easily as they would with an open-face helmet. Like anything that is new, practice makes perfect. If you notice a customer raising concerns about peripheral visibility, remind them to take a quick second and turn their head, then turn back to the road. An experienced rider will make sure to check mirrors and turn their head to avoid an accident instead of relying on a single path of vision. Premium quality helmets offer maximum protection and comfort and it is your job to educate your customers and help them get the correct helmet. Your staff should be advocates of the proper gear and safety. The MIC Gear Up Every Ride campaign is a good resource to brush up on helmets as well as all other gear.